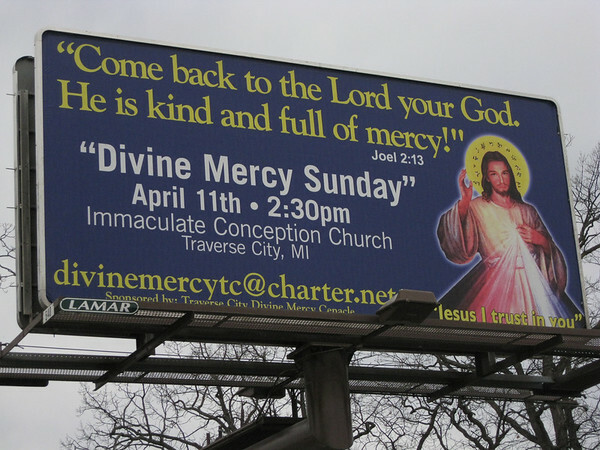 A billboard on Eighth Street announces Divine Mercy Sunday, a day of thanksgiving scheduled to begin at 2:30 p.m. Sunday at Immaculate Conception Church, 720 Second St. The day dates back to a vision received by a Polish nun in 1931. In the vision, Jesus directed the nun to have the appearances of himself as Merciful Savior painted, then venerated publicly. Divine Mercy Sunday was named a feast day in 2000. For more information about local services, contact Anna Courturier, 941-8401, divinemercytc@charter.net. For more information about Divine Mercy Sunday, go to http://www.thedivinemercy.org.